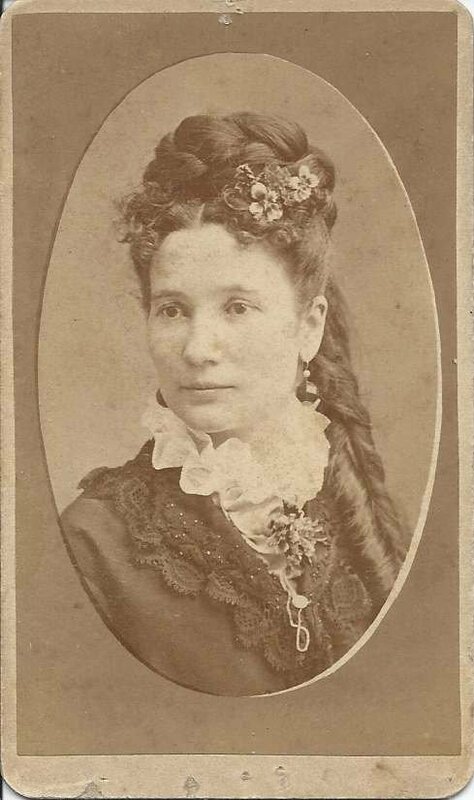 Carte de visite of a woman identified on reverse as "Ruth Lucretia Godfrey, b. July 18, 1844; m. Augustus Robinson". The CDV was produced by the E. S. Dunslee studio of 8 Market Street, Lynn, Massachusetts. Ruth Lucretia Godfrey was born, according to the 1900 US Census of Boston, Massachusetts, in May of 1846, give a year or two either way, which could be 1844. Perhaps the month on the CDV represents her baptism or perhaps the person giving information to the enumerator was in error. She was born in Nova Scotia, possibly in Guysborough County, and came to the United States with her family about 1859. The 1860 Census found the family living at Rockland, Maine. Ruth's parents were John William Nixon Godfrey and Ruth Ann (Scott) Godfrey. Her paternal grandparents were Benjamin and Catherine (Bigsby) Godfrey. Her maternal grandparents were Lemuel and Ruth (Godfrey) Scott. 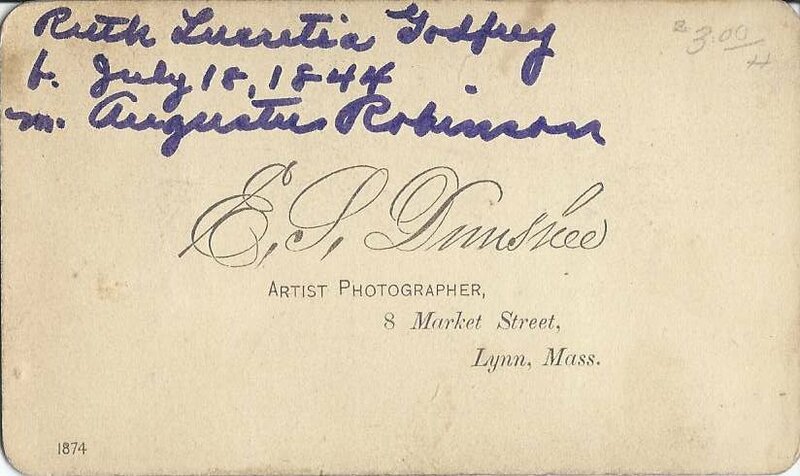 About 1869 Ruth married Augustus Robinson; he was born about March 1844 in Maine. I think his parents were Capt. David and Mary Ann (Fuller) Robinson. The Robinson family was living at Rockland, Maine, at the time of the 1850 Census. Ruth and Augustus subsequently moved to Boston, Massachusetts. They had at least one child, a son Harry, born about 1881. If you have any corrections or additions to the information provided above, please leave a comment or contact me directly.